Anything worth doing usually isn't easy....You live in Mass. which isn't that far from PA. Maybe plan a vacation and pay a visit to Martin Guitars in Nazareth, PA and spend sometime in the Pocono Mountains? I have been on the tour 4x now and every time I learn something new. I'm sure if the kit has a good set of instructions, and drawings, with patience and common sense you could build the kit no problem. Plus, you have many experienced guys on the forum with playing and building those type of guitars to answer your questions, should they arise. 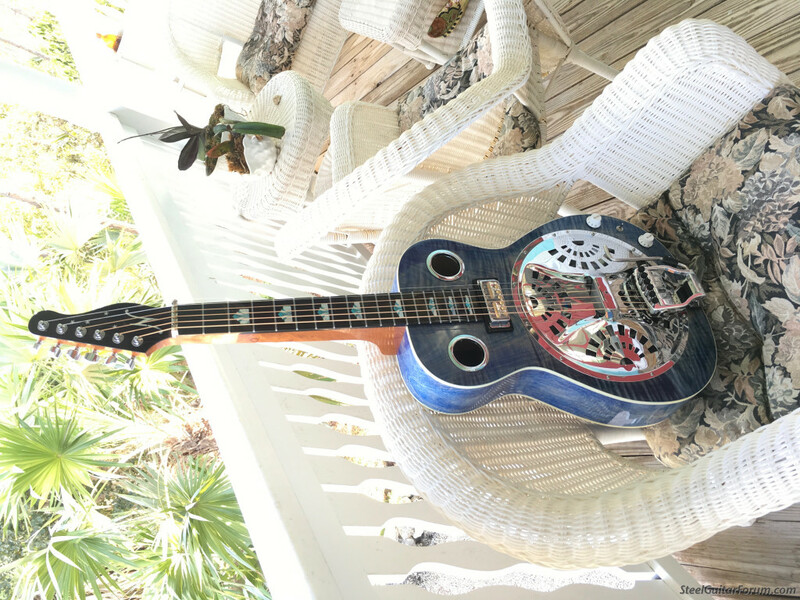 Bill, actually I live in Rhode Island but also in the Florida Keys half the year and I wanted a tropical themed resonator (was thinking a blue dye stain) and maybe palm tree fret markers. Also I’d like a magnetic pickup in addition to the fishman Nashville pickup. Thought I had a luthier to build me one but he had to decline due to construction problems at his shop. If the kit isn’t too difficult it seems like a way to get the custom details I’m looking for. Tony, I've built two of these kits. If you take things one step at a time the task is not that difficult. I'm very happy with mine and it is my "go to" instrument for jams. I installed the Nashville pickup in mine, which works great for my purpose without having the Aura pedal. Wow Dennis! Very encouraging to hear that!! Thanks for posting the photos. That's the spirit, I know you can do it! Did you update your profile? I could have swore it said you lived in Mass.?? Dennis, you did a great job. Nope. Rhode Island in spring and summer, Big Pine Key in the fall and winter. Tony, if you do end up with an active pickup added, with the wiring inside I assume, then just make sure your battery wires are long enough to mount the battery clip inside one of the screen holes. 30 second battery changes. 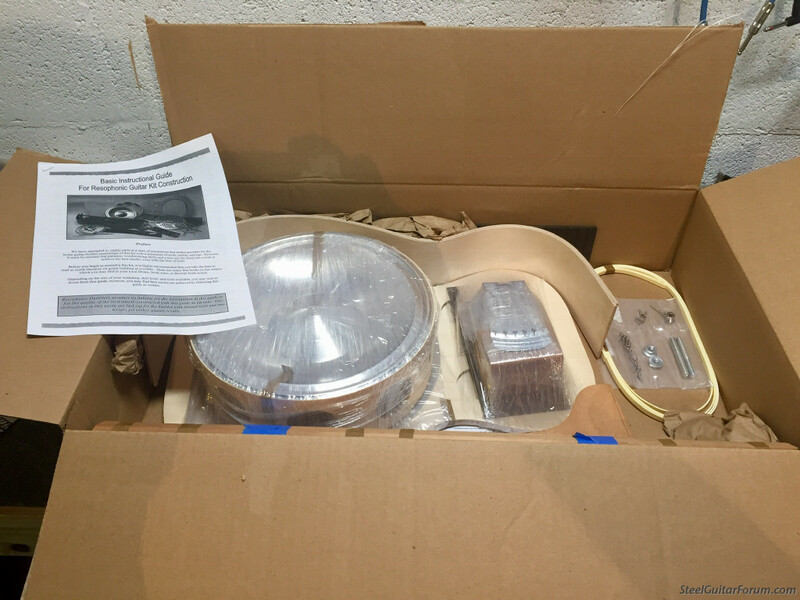 Having played resonator for 40+ years and done restorations and setups on countless instruments I'll say this - assembling a resonator guitar kit is not really that difficult if you have even basic woodworking skills. Finishing is another story, and much more complicated You *can* use rubbed-in finishes but they don't have the durability or protective qualities of a lacquer or polyurethane system. both normally require use of sanding sealers, special "paste wood filler (grain filler - and not the "retail" type) and absolutely require use of cartridge respirators and eye protection (dust masks do NOT filter out chemical fumes - just dust). Polyurethanes can be applied using aerosols but they don't sand easily and it can be very difficult to achieve a smooth surface. Lacquers are easier to sand but more volatile and take far more coats. No matter what finish you choose you need to do complete practice runs with all products on scrap wood before starting on the guitar. Learn how to fix mistakes and how products work together *before* starting on he real thing - do everything from prep to buffing.. First. Last - setup on squareneck resonator instruments is a critical process that is very difficult without guidance from a professional. There are videos available but IMO they really don't go into the kind of detail required to do it properly. Cone fitting, spider squaring and notching of both nuts and saddles has to be done to very tight tolerances - even slight variations can make the difference between a good playing/sounding instrument and one that just doesn't work very well in the mechanical transfer of sound that is the primary purpose of the instruments' design. If you DO build one I suggest it be taken to a professional resonator tech for setup - and if you can pay a little extra for either it's highly recommended. It's what I recommend to all buyers of new low and medium grade instruments, which are rarely (if ever( set up well right out of the box. So there are plenty of things to consider before buying a kit. I'd think long and hard about cost of a good new instrument vs a "DIY" job - it may not be worth it unless you have the experience that goes along with the extent of work involved. 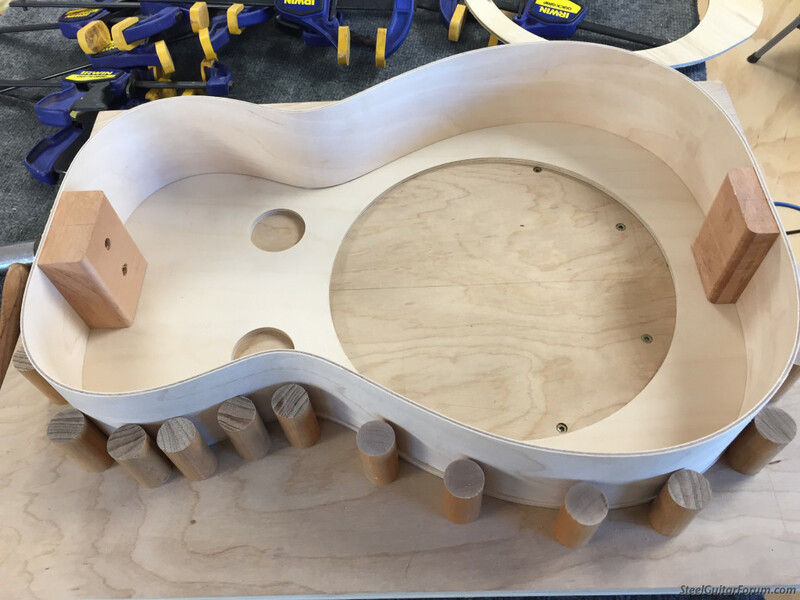 So it came in yesterday and fortunately my friend, Dean Nickless, who is a guitar luthier, has agreed to build it for me. I’m a jack of all trades but sorry, this is a bit intimidating! Going to have some very special features on it. I’ll post pics as they progress. In my experience magnetic pickups and piezo pickups do not play well with each other. If you want the option of that magnetic pickup sound I would actually recommend mounting in with a separate output jack for each pickup. You can then go through an Aura box for the Fishman and whatever chain you want for the mag pickup then blend them outside the guitar. Speaking of Beard and both piezo and magnetic pickups on the same guitar, in the past year Paul Beard added to Jerry Douglas' "A " Game guitar a Jason Lollar Teisco silver foil replica as a magnetic pickup to go with the Fishman Nashville under the saddle acoustic pickup. This same guitar (JD Black Beard signature model) also took a spill out of the back of a vehicle and sustained serious damage. Paul did a great repair job on it and made a video showing the repair process. After this happened I wondered why Jerry didn't just have Paul set him up with a new Black Beard? There must be something about Jerry's regular Black Beard that he finds irreplaceable. The Beard Copper Mountain series also has the same pickup configuration available. Then there's the guitar below. 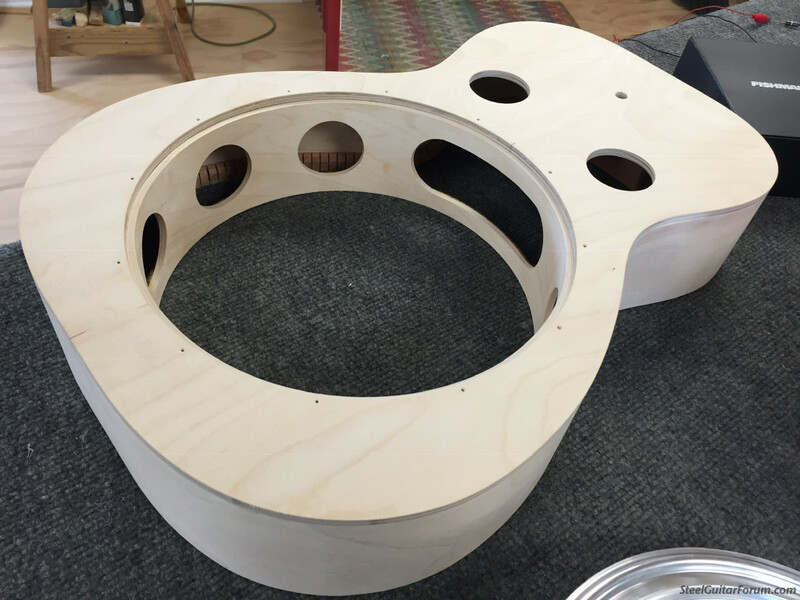 This is a custom E Model just finished for Anders Beck of Greensky Bluegrass. It's a long way up the hill to this guitar from the Beard kit resonator. Sort of a "resophonic combat vehicle." It has everything but the kitchen sink: Lollar Teisco replica pickup, Fishman Nashville pickup, Hipshot Double Shot tuning changer device. control knobs on the top. I asked some questions about blending the pickups on the Beard Facebook page. It turns out that it's a stereo split cable. Each pickup has it's own volume control. So with the selector switch in the center you can control how much of each pickup is sent Either in stereo (discrete) or mono (mixed) mode.The mixed (mono) mode is only activated when a mono (standard plug is inserted). Only one 1/4" jack. Near it is what appears to be a door for a battery compartment. Not sure what the deal is with that, I'll try to find out. The battery power is for a Fishman active preamp I believe. Presents the 2 outputs at compatible levels/impedances. "Mark, it houses a 9 v battery to run the on board buffered preamp. The preamp allows you to mix the magnetic and piezo pickups together in mono. The pickups have conflicting impedances and this allows them to operate In a balanced fashion." Nice photo. Keep 'em coming Tony so that we can can gain an understanding of the process. After our sidebar discussion of pickups/electronics do you still have plans in that direction? I'm watching this with interest as well. Good for you Tony. I see it has a sound well. You might consider opening the holes up in the side of the well (before install) - make them bigger. 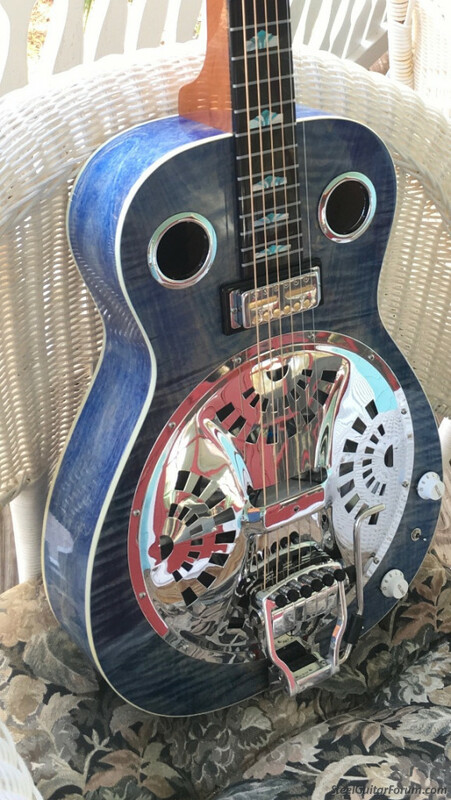 Many folks theorize the better bass response that a resonator with sound posts exhibits is due to the fact that the back of the guitar is freer to move and resonates better. I have personal experience improving the tone on my OMI with sound well by doing away with the neck extension connection to the back that occurs inside the sound well. I have not opened the holes though. I heard about this over on the resogut forum. 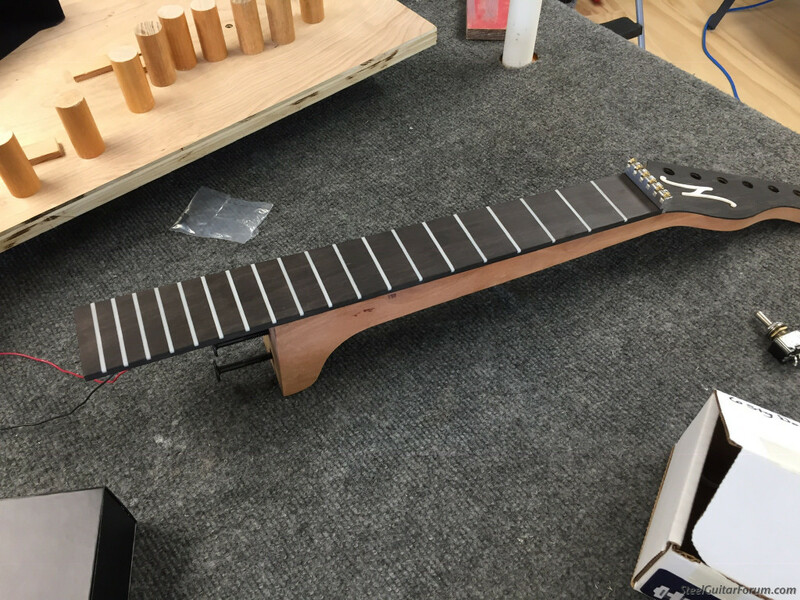 So apparently you decided not to use the neck that came with the kit and your luthier built one from scratch? It looks great! Every so often I'll come across a dobro with a "Fenderish" headstock. I really like this one - well executed curves. Tony is that a beard roller nut? I don't think Beard sells a roller nut unless you buy the Hipshot DoubleShot device from them. But you can buy one from Hipshot for $79. 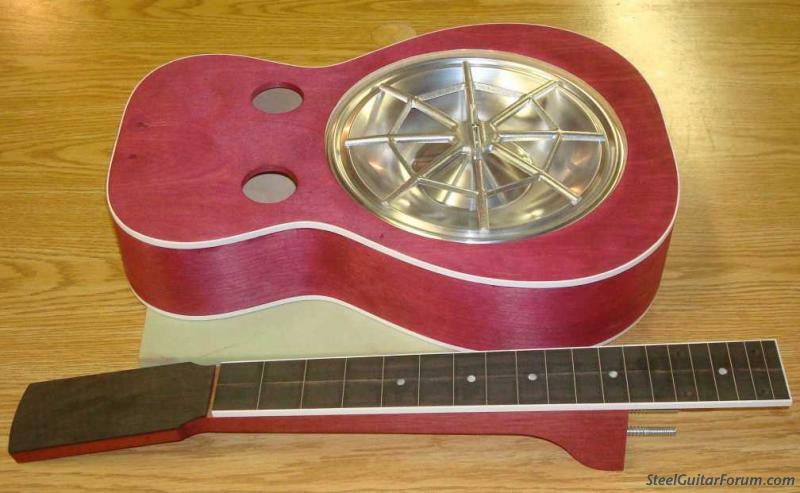 I believe the kit guitar ships with a regular bone nut. Posted 21 Jan 2019 6:12 am It’s finished!!! That looks fantastic Tony !! How does it sound and how do you like the hipshot doubleshot? F-G ? Congratulations! Chris I love the Doubleshot. Use it to quick change from open G to open D.
I was very lucky to have a luthier friend of mine build this from the Beard parts, although we ended up making a whole new maple top because the sound holes were too close together to allow room for the magnetic pickup.